A Chinese man has been branded the country's very own Spider-Man after he climbed up a building with his bare hands to save a child. 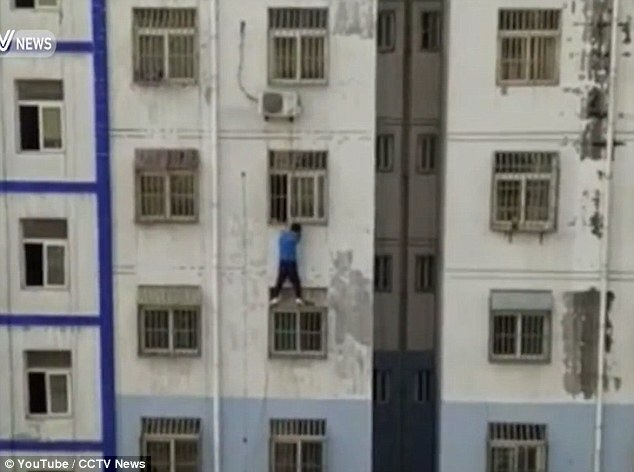 Amazing footage captured in Liaocheng, a city in the east of China's Shandong Province, shows Liang Lei scaling several floors to grab the boy. The unnamed two-year-old child was dangling out of the window by his neck, having got caught between two bars. According to reports, the youngster was home along when he attempted to climb out of the window, before getting snagged in the security bars. Lei rushed to the young boy's aid after hearing screams for help after a crowd of local residents gathered below the boy at street level. Lei held on to the boy until a locksmith was able to unlock the door to the flat and let both of them in.